You don't have to be a seagull to be "Jonathan Livingston". Anyone who pushes the boundaries dictated by the physical, mental and emotional limitations of their species is "Jonathan Livingston". Evolution itself is a proof of this. Every specie has had its fair share of "Jonathan Livingstons", except perhaps the Dodos. They never had a chance. A blink, and they were gone. By the next photo, it seems to have realized the absurdity of its posture and is asking me "What is so funny? Be thankful that you don't have stick-like front legs." Now what it chooses to do with this realization will decide whether this Giraffe is going to be a "Jonathan Livingston" Giraffe. 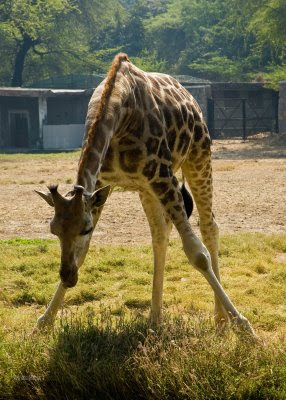 A giraffe doesn't usually sit down because it cannot quickly get up and get going. 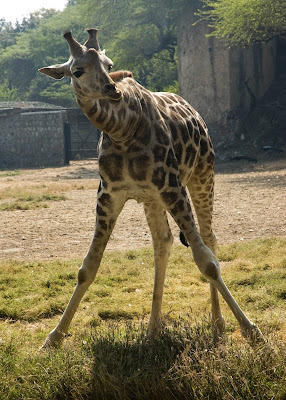 This giraffe can accept that this is what it has and learn to make the best of it. Or it can decide to explore whether there are other possibilities. For example, it can exercise its knees and make them strong so that it can sit down and get up as quickly as a deer. If it chooses the first option, it would be just another Giraffe. However, if it chooses the second option, it could become a "Jonathan Livingston" Giraffe. In most cases, the choice lies with you. Whether you want to be just another one in the specie or whether you want to be "Jonathan Livingston", is for you to decide. Every challenge is an opportunity to be "Jonathan Livingston". After all, homo sapiens is the specie that has seen the most "Jonathan Livingstons" till now.